"The dedicated Cybersecurity and Defense team at Carahsoft specializes in providing federal, state and local government agencies with a variety of solutions to secure their cyber ecosystem. Our trained and certified representatives have a thorough understanding of the government’s cyber requirements and mandates, allowing us to accurately match our cybersecurity portfolio with our customer’s specific needs. 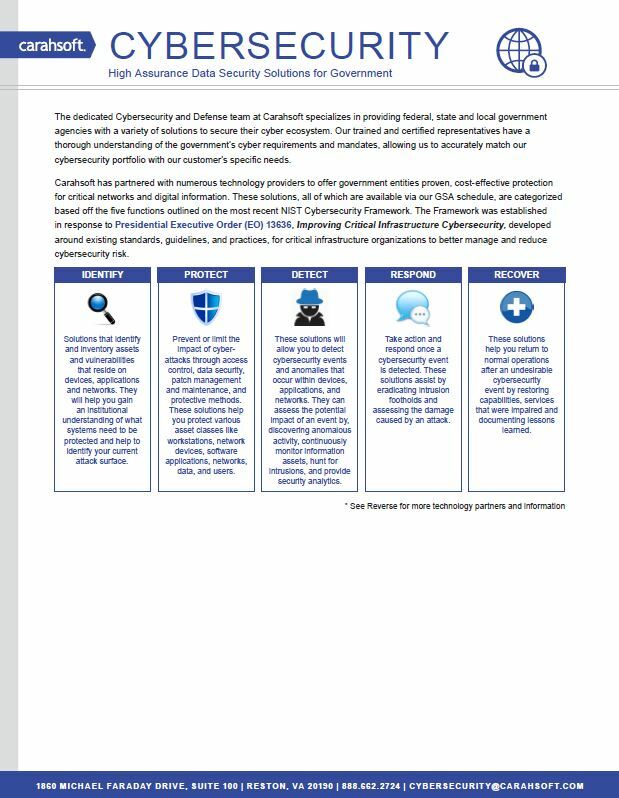 Carahsoft has partnered with numerous technology providers to offer government entities proven, cost-effective protection for critical networks and digital information. 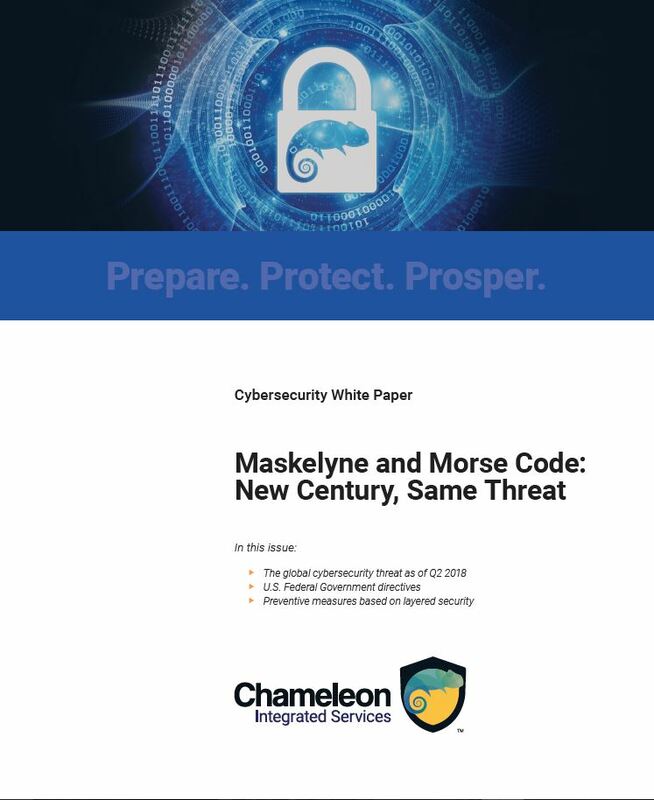 These solutions, all of which are available via our GSA schedule, are categorized based off the five functions outlined on the most recent NIST Cybersecurity Framework." 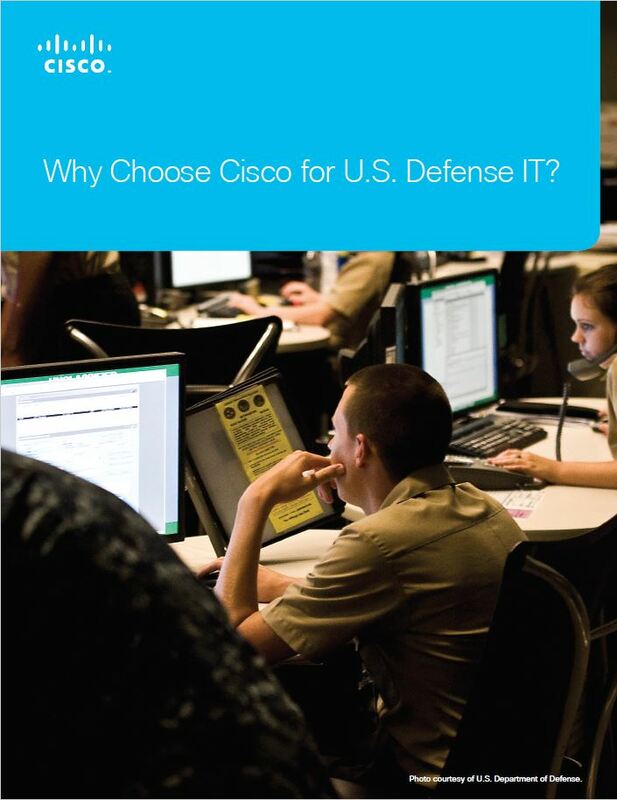 Why Choose Cisco for U.S. Defense IT? "Today Cisco stands at the center of the drive to digital transformation, offering innovative hardware and software, and top-flight professional services to help you solve your most vexing challenges. Just as Cisco led the first wave of the Internet, so will we lead the next — creating a digitized world where the networked connections of people, process, data and things are brought together to unlock unprecedented value. The power of the connections unlocks new types of data and insight, and physical and virtual environments are blended seamlessly. “Digital” is the key term in nearly every conversation about the future of war and defense. The DoD’s digital transformation is a push to provide garrison and warfighting personnel with seamless and secure access to the resources they need, when and where they need them." How quickly and completely can we get to normal after an attack? 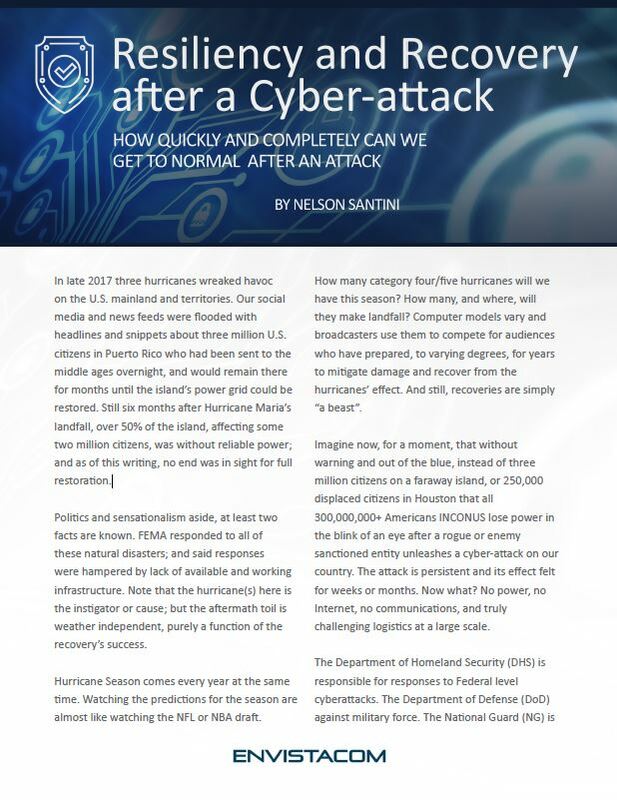 "In late 2017 three hurricanes wreaked havoc on the U.S. mainland and territories. Our social media and news feeds were flooded with headlines and snippets about three million U.S. citizens in Puerto Rico who had been sent to the middle ages overnight, and would remain there for months until the island’s power grid could be restored. Still six months after Hurricane Maria’s landfall, over 50% of the island, affecting some two million citizens, was without reliable power; and as of this writing, no end was in sight for full restoration. Politics and sensationalism aside, at least two facts are known. FEMA responded to all of these natural disasters; and said responses were hampered by lack of available and working infrastructure. Note that the hurricane(s) here is the instigators or cause; but the aftermath toil is weather independent, purely a function of the recovery’s success." "The most compelling story in cybersecurity can be encapsulated in one word: overwhelming. A full-scale war is being waged, and in many cases against a small army of defenders deployed at internal business units. The cost of worldwide cybercrime is estimated to reach $6 trillion by the year 2021—a 200% increase from 2015. Further, cybercrime is described as the greatest threat to business, with cyberattacks increasing in size, sophistication, and damage—and they have become the fastest growing crime in the U.S.
Where strong preventive and defensive cybersecurity operations should be in place for government agencies as well as for commercial and regulated industries—there is, instead, a growing gap."